Now, clearly, Caramel Apples are not the healthiest snack option…but a candy-covered apple is surely better than a plain old candy bar, right? And besides, allergic kids should get to experience some fun food as well! 1. Pour pretzels into the bowl of a food processor and pulse until they resemble coarse bread crumbs. Transfer to a shallow bowl. 2. Wash and dry popsicle sticks and insert one into the stem side of each apple. 3. Unwrap caramels. In a small saucepan, melt caramels and milk together over medium heat, stirring constantly until melted and completely smooth. Turn off heat. 4. 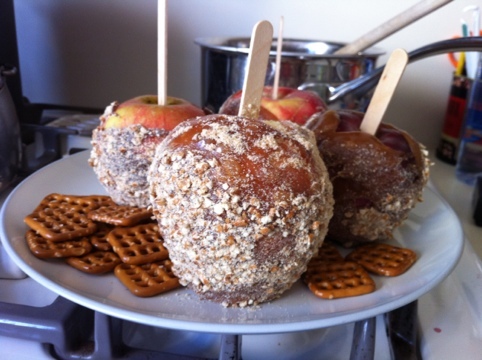 Dip each apple into melted caramel, turning apple around in the mixture to make sure that you get the whole surface. Roll immediately in crushed pretzels. 5. Stand apples up on a plate in the refrigerator until you are ready to eat. Disclaimer: I wrote this blog post while participating in the SocialMoms and Snyder’s of Hanover blogging program for which I received monetary compensation. For more information on how you can participate, click here. 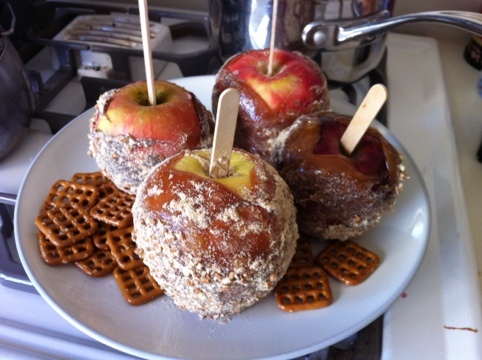 This entry was posted in A Peek Into My Kitchen, Food and Drink, Products, Uncategorized and tagged allergies, candy apples, nut-free, pretzels, recipes, snack, Snyders, socialmoms by jessica. Bookmark the permalink. Hi, I just saw your comment… a ltlite over a month later!!! So sorry… I found the recipe online. Hope this helps… it was a hit at the shower.INGREDIENTS:- 8 liters of Sprite/7-up- 1 gallon of rainbow sherbetPREPARATION:- Buy ice cream in half gallon containers.- Take first half gallon out and place it in the punch bowl. – Add a two liter container of Sprite to bowl and as it melts break off bits of the ice cream. -Freshen up as necessary with additional ice cream and Sprite/7-up. – To add a ltlite more flare, add fruit.